Cain wants to be called Pierce even as much as I want to call him Cain. This is going to be hard. He killed his right-hand man since the guy went rogue. He says feeling all the pain, etc., of being human proves what a sick sense of humor Lucifer's father has, but he would never work for the guy. Maze is testing knives on Chloe's walls and covering it up with Trixie's drawings. Chloe doesn't pay attention to the way Maze talks, sits down and apologizes, waxing on about Lucifer. When everyone gets to a crime scene of a famous surfer on the beach, Ella is very standoffish. When Lucifer finally arrives, he asks for Chloe's help investigating someone. She's incredibly annoyed. Chloe has finally pegged Lucifer as an egomaniacal narcissist. Lucifer's next angle is to go to Linda for advice. He decides he needs to make it all about Chloe so she'll want to make it all about him. Charlotte and Ella have a girl talk about standing up for themselves. Chloe discovers Pierce packing up and learns he put in for a transfer. She tries to talk him out of it, but he's running away from himself. Amenadiel is getting human diseases. Chlamydia, to be exact. 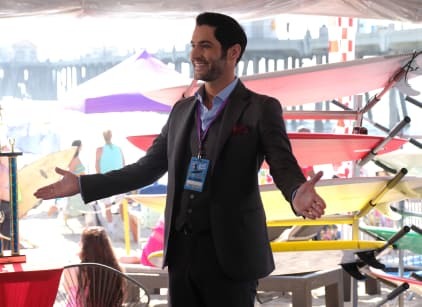 Lucifer appears on the beach with a way for Chloe to work undercover. Dougie thinks he's being interrogated because he killed a seal. Charlotte needles Pierce before telling him to apologize to Ella. Lucifer asks Dan how to get through to Chloe. When Maze gives Linda a lovely gift of a bone cutting knife because she's an amazing friend who didn't continue on with Amenadiel, Linda wants to come clean. But Amenadiel calls Maze with the STD news, first. Dan goes undercover as one of the surfer dudes. The leader of the Orcas is a woman. Wild Child is her name. Ella tries standing up for herself with Lucifer, and she tells him he's transferring out of the department. When Lucifer asks Cain what he desires, Cain reveals he wants to die. He said it has nothing to do with Lucifer, but everything to do with Chloe. When Cain describes his life, Lucifer says it sounds like hell. Cain also says he's here because Chloe can make Lucifer bleed. He got Lucifer out of the way to see if maybe she could kill him, too. Instead, Lucifer sprouted wings, came back early and screwed up everything. Dude knows nothing about what happened to Lucifer. Lucifer is gutted. When Wild Dog comes up and punches Dan in the face, he loses communication with him and the gang. By the time Chloe and Pierce see what's going on, Dan is participating in a paddle out ceremony for Moon Dog. The Orks don't go up to those private beaches because they don't see the point. The ocean's a big place. When Chloe sees her desk, all color coded, she blows a gasket. There are no private beaches in California. Chloe and Lucifer take their picnic to a woman's house and party outside her house. She had to send a message, so she sent a message by murdering someone. Geez. When Lucifer finds out it wasn't personal at all, he splits. He has an idea about his kidnapping. Linda and Amenadiel decide they really like each other at the same time his doc says Chlamydia was a false positive. Unfortunately, Maze was peering in through a window. She's knifing things. Ella tells Pierce why she likes talking and even gives him a hug goodbye. Lucifer realized his wings were returned by dear old dad to screw up Cain's plans.